That’s Chaz on the left with big boss Rick on the right, Andrea #1 is in the front. It was a bittersweet gathering as Chaz is Going to California. After over 20 years of working for our company in various positions Chaz is going out for a new life running a Bed & Breakfast in Laguna Beach, California. 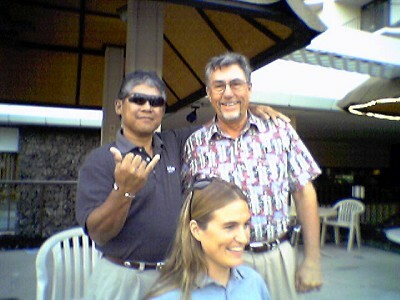 I’m sure Chaz will bring the aloha spirit with him to the mainland and the lucky folks who stay at Eilers Inn which is named after an area surfer, there’s even a statue of the guy on the property. Quite fitting as Chaz has done quite a bit of surfing in Hawaii. Tomorrow should hopefully produce more scenic images as it’s adventure day.